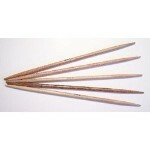 Step up to these high quality rosewood knitting needles with a smooth-as-silk polished finish that does not wear off. The brass cap attachment of the cord to the tip results in a strong join that has exceptional smoothness and durability. Pointy tips allow you to get into tighter stitches with ease. These beautiful needles are manufactured by the artisans of Zeshane Handicrafts in Nagina, India. 10% discount on these needles if you buy 8 or more. These are extremely high quality needles. They are very pointy, they feel warm and smooth to the touch and the join is very smooth! Knit with these once and you'll be spoiled. You will never want to knit with another type needle again!